I’m sorry, I didn’t understand you. Have you been working with a student who is hard to understand because of multiple sound errors? Or maybe she has a diagnosis of Childhood Apraxia of Speech? Perhaps he is shy and is not using precise articulation or employs a low volume? These children can sometimes be difficult to understand when they speak. Those of us in the field of speech language pathology have many skills and tools to assist us in deciphering unintelligible speech. One of the most powerful tools we can employ is the simple acknowledgement that what was conveyed was not understood. I worked with a young girl who had recently been diagnosed with Childhood Apraxia of Speech, a motor planning disorder that impacts the way a child produces the sound sequences needed for speech sound production. I noticed that her mom seemed very engaged with her as she spoke in the hallway outside my office. When they came inside the therapy room I saw something different and dangerous. The mom, perceiving her daughter’s struggles to communicate deeply and personally, was following along with her even though she had not understood. When the little girl babbled a string of what sounded like nonsense, the mother commented with “Oh, yeah? I see.” The first time the little girl smiled and kept talking. The more I observed their interactions, however the more I noticed. Once the little girl asked her mom a question, but because her mother didn’t understand her and commented instead of answering her, a look of disappointment flashed across the little girl’s face and then defeat. She ignored her request and continued playing, giving up on her message. This statement is powerful. It’s powerful for children. It’s powerful for parents. It’s powerful for teachers. It is powerful because it is honest and when used with follow-up requests this statement can bring about real and rapid change in children with speech production difficulties. If the child is unaware they are mispronouncing words, they do not possess a reason to make changes. If it’s not broken why fix it, right? But it can be difficult to acknowledge that effortful speech is not understood. We want to encourage our children to keep trying as we help them learn to produce better speech sounds. So, how do we correct speech without crushing spirits? I have found explaining my intent is important for establishing rapport and a working relationship with my kids. I often tell my clients, “I want to talk with you about your story, but I’m having trouble understanding your words. Please keep trying to talk to me and we will work hard together, ok?” Now the child knows I am invested in the conversation. His or her struggle has been acknowledged and we have a plan to solve the problem together. At this point, we can begin employing some strategies to help them communicate with others. Lisette from Speech Sprouts asks for more information. 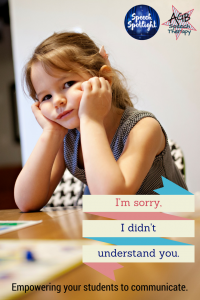 When I don’t understand a child, I will say “Sorry I didn’t get that, can you tell me more about it?” I find that If I simply ask them to repeat, they repeat with the same unintelligible misarticulation… and I am still not getting it. “Tell me more” gets the child to add different words to the conversation and increases the chances I will understand the context and original meaning. It also gives them a strategy for conversational repair they can use with others. I love to share this tip with my parents, too! Additionally, students may benefit from learning to shorten the message and speak more slowly. So, when you encounter a child who is difficult to understand, acknowledge the problem, explain your intent to understand them, help them to expand on the expression with action, more context or the use of alternative communication devices. Then you can teach them how to independently recognize when their listener missed their message and self-correct without prompts. “I didn’t understand you” can be the beginning of empowering your students to be better communicators. This is such an important topic! Thanks for a powerful post.